Turkey is fighting alongside the most extreme “Islamist gangsters” it could find against Kurds in Syria, using high-tech weapons bought from the United States, Germany and Britain, Nujin Derik wrote in the New York Times. 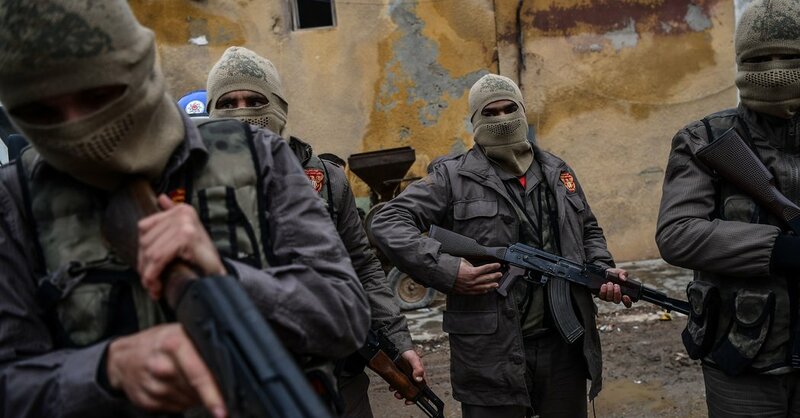 The Islamists include the fascist Grey Wolf death squads and al-Qaeda affiliates, all of which belong to the Turkish-backed Free Syrian Army, Derik, a member of the Kurdish People’s Protection Units (YPG), said in an op-ed contribution. They are being backed up by F-16 aircraft, German-made Leopard tanks and regular Turkish soldiers, she said. “Yet Mr. Erdogan calls us terrorists, asserting that we and the Kurdistan Workers’ Party that he has warred with in Turkey are identical,” Derik said. “The hypocrisy of this transparent justification for his invasion is astounding. Our forces have led the fight against the true terror represented by the Islamic State — even while Turkey provided it support and its oil was sold in Turkey. President Recep Tayyip Erdogan has ordered the Turkish military into northern Syria to tackle the YPG, which belongs to the same umbrella organisation as the Kurdistan Workers’ Party (PKK) and supports the same ideological leader, Abdullah Ocalan. While the PKK is recognised as a terrorist organization by the United States and European Union, Western powers have supplied the YPG with weapons and training to help defeat Islamic State. “Is the world really willing to believe we are terrorists because we share the Kurdish freedom movement’s goals of democracy, environmental protection and women’s liberation?” Derik asked. She also questioned whether the Trump administration now cared about anything other than its own immediate tactical interests. Instead of allowing the carnage, Washington should pressure its NATO ally, press for a no-fly zone over Kurdish regions and take a moral stand. The Kurds have set up democratic institutions in the region and have welcomed refugees, who now have nowhere else to go as the Turkish assault ensues, she said. “Do Western powers now believe that too strong a commitment to their own professed democratic ideals is terrorism? Mr. Erdogan, on the other hand, is an enemy of women, whom he has called “half persons,” and the views of his fundamentalist minions are even worse,” Derik said. Opinion | We Fought for Our Democracy. Now Turkey Wants to Destroy It. The United States must end this unprovoked attack on Syrian Kurds by its ally.